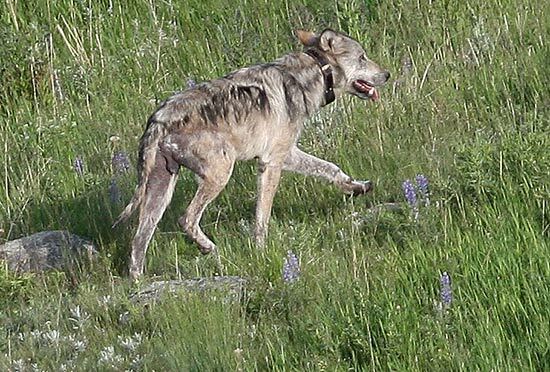 In recent years, mange has grown as a problem for wolves of the Greater Yellowstone ecosystem, both in Montana and Wyoming, although none has been seen inside Yellowstone Park itself. A recent query posted to this blog asked about current conditions, so I contacted Mike Jimenez of USFWS and Carolyn Sime, Jon Trapp, and Liz Bradley of Montana Fish, Wildlife and Parks. Mange is known to affect just one Wyoming wolf pack this year, according to Jimenez. That is the Absaroka Pack, east of Cody. This pack has had a mange problem for years. In Montana, mange has declined to three packs. They are the Mission Pack in the north end of the Montana Absaroka east of Livingston. Also afflicted are the Chief Joseph Pack and the Donahue Pack, which live on the fringes of Paradise Valley. Below is a photo of a mangy Mission Creek Pack wolf. Sime told me that one male in particular in the Chief Joseph Pack is mangy. Folks may recall that the Chief Joesph Pack was one of the original 1996 Yellowstone Park packs, but it slowly drifted north to reside entirely outside the Park.